Usually packing for a trip could stretch on a few days and it’s easy to overlook something to pack. Recently the best way was to write list of necessary things on a sheet of paper and pack them accordingly to it. But what if you think about another one useful trifle you need to put into a bag while standing in a queue and the packing list is left at home? There is a useful solution for iPhone and iPad owners from NIX Solutions that develop apps for iPhone – uPackingList app. 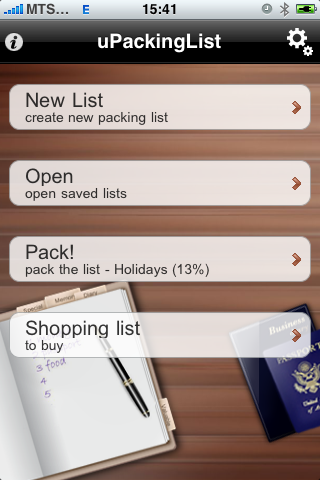 uPackingList application will help you not to forget even the smallest thing during packing for a trip. Just create a list of needed things or use prepared template and update it every time you think about new stuff to take. It could turn packing for any trip into easy and convenient process – whether it is business trip or journey to the jungle. uPackingList is also available for Android platform. Let’s take a look at main features of uPackingList app for iPhone, iPad and iPod Touch. Application greets you with a comprehensive “welcome screen” where you can create your own travel checklist. The next step is to add missing thing just choosing it from more than 300 items sorted by categories. It’s a good idea to use a search function. Can’t find a very special subject in a packing list? Add them in a few taps: just name it and add to the proper category. Now you are ready to start packing for travel: tap on Pack button and mark every packed into bag item. It will be moved down for you to concentrate on remaining things. Do you need to take 3 pants, 4 shirts and exactly 5 chopsticks? Mark a quantity to anything in your trip packing list and even make a photo of them to recognize. 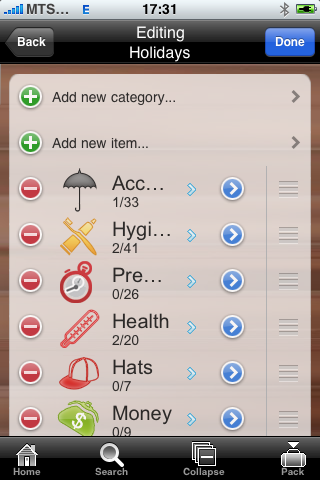 Latest uPackingList version has a feature to make a shopping list of necessary things. 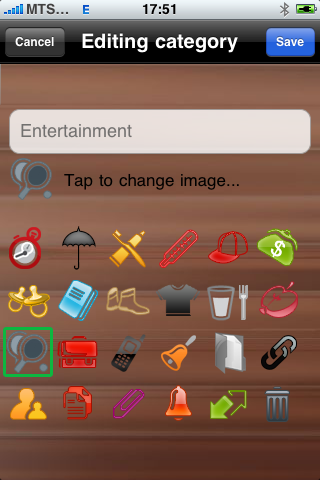 To remember to buy important things put the icon in item detailed description and corresponding object will automatically appear in Shopping list. Now you won’t forget about it! uPackingList may look different. You can choose three background images: ocean, business and tourism accordingly to a type of a trip. 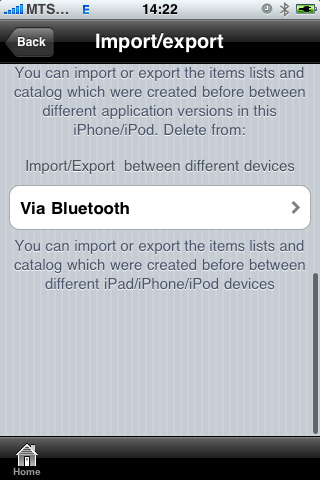 It’s also possible to export and import your travel packing list from Apple devices like iPad, iPhone and iPod Touch. Create packing list on your iPad using big screen and import it to iPhone or iPod Touch to take the list with you in a pocket. The new version of uPackingList 1.10.1 is out now. Find out more about the improvements added and get your new uPackingList app! uPackingList application is available in AppStore in free version (contains advertisement) and full version with more functions like quantity, comments and photo for every item, changeable category icons and different background themes. uPackingList became very popular and we decided to translate it to other languages. Today this application for iPhone, iPad and iPod Touch localized to English, Russian, Italian and German. uPackingList app will help you to feel relaxed while packing for a travel or picnic and take with you everything you have planned. Any suggestions regarding functionality, content and future updates are warmly welcomed and will be processed promptly: [email protected]. I just bought the full version this morning. I had a saved list on the free and I can get it imported and saved into iTunes. It will export it back to the free version, but not to the paid version. Any suggestions for me? Guidelines for uPackingList App Users for detailed information. 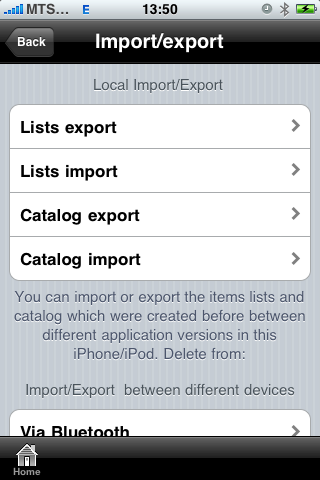 Click on “Settings” and select “Import / Export”, then “Lists export”. Next, select the desired list and click “Export”. The list has been successfully exported. 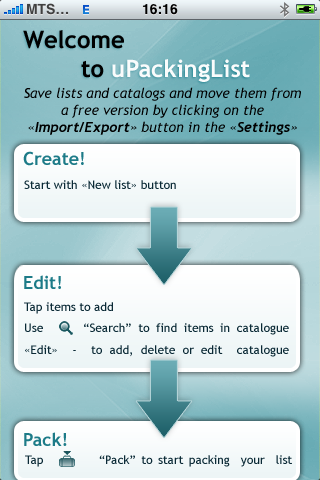 Now open another version of the application and select the settings and click on “Lists Import”. Select the list to import. The list has been successfully imported.